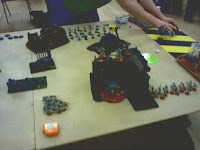 I got on down to my friendly neighbourhood gaming club a little earlier than usual to ensure I got a game but that didn't work out because I still arrived after everyone else so those that were playing 40k had already set up and started so I had to wait until someone finished before it freed up a player. On the plus side I got to watch Roy and his Imperial Guard utterly demolish 1000pts of Necrons. His four Vendetta's filled me with an all consuming dread. Lookignn at the 1000pt 'nid list I have just what have I got that can get to those and punch a hole in them without them flitting off to pick them apart with combined twin-linked las-cannon fire? And that's not even considering the troops inside or the big blob of guards and heavy weapons teams shooting from cover! Anyway, the game ended quick and I opted to face the Necrons to allow my opponent, who I'm ashamed to admit I don't recall catching his name, a chance to regain some pride. Dawn of War deployment with four objectives, one in each corner of the board. Now unfortunately I only took one photograph. The new bigger hall we use does not like pictures on my phone, just not enough light. So I took one pic and seeing the result didn't bother although some tweaking with the colours isn't so bad, here's a before and after. So how did the match go? I won, at the 5th turn. I had two objectives to his one and one contested. The list itself is some usual stuff - my standard Warrior unit with Deathspitters and Barbed Strangler and a prime with Deathspitter, lash whip and Bonesword. They sat on an objective and rained fire down on anything they could see. Not the most effective use of 210pts but the unit only lost 2 wounds for the game. I had a Trygon, instead of a Prime, who deep-struck which sucked because 6 St5 BioElectric Pulses aren't half as good as 12 Containment Spines [technically they are except for a 12" range versus 18" but that was irrelevant in this case]. The end result was that he had no less than three models with 'mind-shackle' scarabs so having a Monstrous Creature do D3 damages to itself on a 3D6 leadership roll [at least the Prime has Ld10] isn't pretty. He did tarpit a unit for three turns though but it's not what you hope for it to do. The mind shackle scarabs were a royal pain in the a$$, causing not only tthe Trygon but a couple of Hormagaunts and the Tervigon to self harm. I was incredibly fearful of these things and having three characters wielding them it was a nightmare to try and whittle the unit in an attempt to get to the danger zones. As it was the relentless fire of the warriors and the devgaunts did the most damage but it wasn't totally successful as the warriors kept getting back up. The Tervigon also deviated a load of cluster spines on top of the Hormies so it was the Tyranids pretty much eating themselves that night. The Tervigon only spawned 14 termagants in the first turn and pooped out. They captured an objective but were then slaughtered by scarabs. Outflanking Stealers came in on the left, which I didn't want but in actual fact given the loss of the Termagants the Stealers rampaged through the scarabs with the Broodlords adrenals insta-killing a base at a time. In the end the Stealers secured the objective and the objective in the building just out of shot top left was secured by some Immortals that never fired a single shot all game! Ultimately I'd be happier with a Trygon Prime if it's going to deep strike but I don't know what 40pts to shave off to get it abd looking at the Guard army I'm really surprised and concerned as to what I could be facing in June. I don't expect 'nids to be competitive and even though I like small battle points lists this 1000pt army feels barebones and weak even though a few of the gribblies have upgrades. Much to think about.